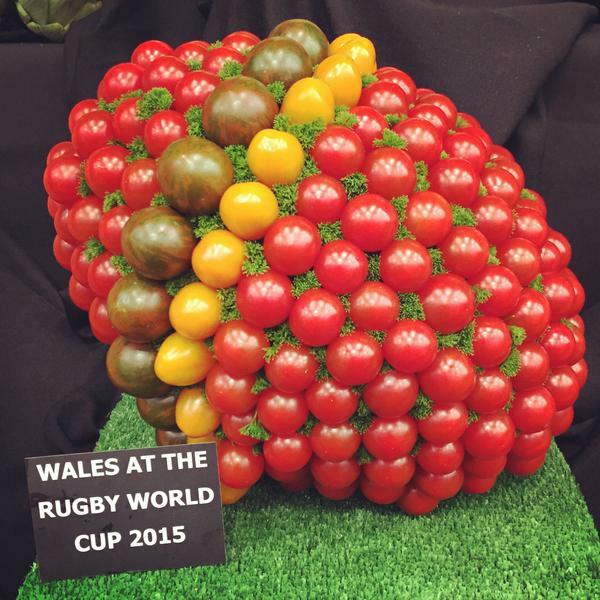 Photos of a rugby ball created by Anglesey veg king Medwyn Williams from tiny tomatoes in the colours of the Welsh team have gone viral. Fans hoping to see their team triumph at the clash with England at Twickenham showed their support by sharing the images of the tasty creation across social media. 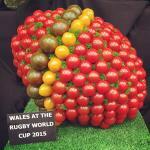 Chelsea gold medal winning grower Medwyn, whose vegetables are showcased at Bodnant Welsh Food Centre, made the tomato rugby ball the centre piece of his stand at the RHS show at Malvern. It was a personal triumph for Medwyn after picking up a gold medal for the best display at the Malvern show, making it his second gold in succession at th RHS event. The rugby ball was the idea of Medwyn’s rugby-playing son Alwyn, who works alongside him at their veg business at Llanfair PG, Anglesey. However, it was Medwyn’s wife Gwenda who had the painstaking task of creating it more than 100 tomatoes, all fixed to an oval of flower arranger’s oasis with cocktail sticks. “It took her about two hours to do on Thursday, and we’re expecting it will stay fresh across the weekend,” explained Medwyn. 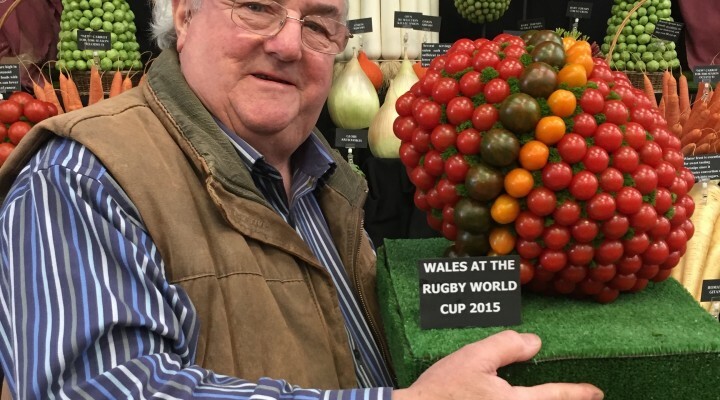 “It’s been very popular on the stand, with lots of people stopping to have a look and take photos, as they’ve never seen a rugby ball made from tomatoes before, and especially never in the new Welsh team colours. “Gwenda used three varieties of cherry tomatoes – for the red, representing the Welsh dragon, it is Tastyno, while the yellow, for the Welsh Gold, is Yellow Santa. Medwyn picked his Malvern exhibit, which has more than 40 varieties of vegetables on display, from among the produce he grows and supplies to Bodnant, the centre of excellence for Welsh food in the Conwy Valley. “What is on the stand at Malvern RHS Show are the same as the vegetables that I took across to Bodnant just before we came to the show. The leeks and parsnips on sale there now were growing earlier the week alongside the ones on this display stand here at Malvern. “I like to think that everything we put on sale is good enough, and tasty enough, to win a prize, whether it’s a garden show or food competition,” explained Medwyn, who won his first RHS prize 20 years ago, and now has 11 Chelsea gold awards under his belt. Chris Morton, managing director of Bodnant Welsh Food Centre at Tal y Cafn, says that Medwyn’s vegetables continue to prove a huge hit with shoppers. “We pride ourselves on stocking seasonal local fresh produce of the very best quality, and that’s what Medwyn delivers for our customers. Our research shows that shoppers return again and again to Bodnant because they can find food that inspires them. Born in the Anglesey village of Paradwys, Medwyn grew up in Llangristiolus, and began growing veg when he was just eight, helping out his dad, a farm worker renowned for the length of his prize-winning carrots. He started showing at Chelsea after presenting S4C’s coverage of the show. Today he is President of the National Vegetable Society, and a member of the RHS’ Fruit Vegetable and Herb Committee, which he previously chaired. Bodnant Welsh Food Centre has its own dairy making cheese and ice cream, plus an on-site bakery and butchery, with award-winning pies. There’s also a wine store and tea rooms plus the Hayloft restaurant and farmhouse accommodation. More details at www.bodnant-welshfood.co.uk or call 01492 651100. This entry was posted in Featured, Food, News, Sport. Bookmark the permalink.